‘I never thought of becoming a virtuoso. Virtuosity, with its concert tours, has always repelled me’, Manuel de Falla told a journalist in 1915, by which time he had virtually turned his back on composition for solo piano. 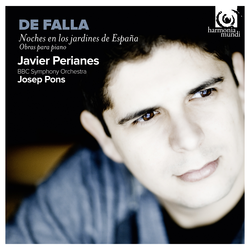 He did occasionally return to the genre, but it is a fact that his corpus can be contained on a single CD, along with the famous Nights in the Gardens of Spain with orchestra. The titles proclaim their indebtedness to other composers, yet the music is highly personal! In order to carry out this exciting project, Javier Perianes and Josep Pons went back to the sources, the manuscripts held in the Archivo Manuel de Falla in Granada.